What’s the Library Worth to You? I use the library for everything. It’s true that I work in a public library, so I almost can’t help but use all of their many resources. Even on a day off, I might still sneak into my local library to use their printer or check out an item, and say “Hi” to the librarians there. I am a voracious reader (fiction, non-fiction, children’s, teen, adult – you name it!) and can afford to follow wherever my curiosity leads me, because all the library books are free. When the Grammy nominations come in, and if I am not familiar with certain performers, I will request their music CD’s from the library. Speaking about “buzz”, there are so many clever cable and streaming TV series these days. I don’t have cable, nor do I subscribe to Netflix or a streaming service, so I depend on library DVD’s to keep me up to date. As a resident of Massachusetts I can get an ecard from the Boston Public Library, and use Kanopy to gain access to all the indie films or top-rated documentaries that might not come to the suburban theaters. Massachusetts is a rich source of museums and other hotspots. But, as I’m not rich, I check out museum passes from the library to get in free or at reduced price so I can be as cultured as a Boston Brahmin. Did I say hotspot? Yes, the library has WiFi hotspots that you can borrow, too! I found that invaluable when I was away at a place without internet service and had to remain in contact with the wider world. As an experiment, I calculated the value of my library use from January 1, 2019 to April 11th using the I Love Libraries website calculator. Taking into account print, electronic, and audio/visual resources as well as computer usage, museum passes, databases, programs that I took advantage of, the grand total came out to… $1,775.80! Not a bad investment, considering I got my library card for free! How much have you saved this year using the library? Categories: Community, Databases, Library Resources, Museum Passes, National Observation | Tags: calculator, Library Resources, library services, library use, National Library Week | Permalink. Categories: Celebrations, Community, Library Resources, National Observation | Tags: Angela Clarke, Chris Riddell, community center, haven, libraries, National Library Week, safe haven | Permalink. Libraries are places of information. When most people think “library” they think books. And while that is certainly true, these days books take different shapes, such as e-books and audio books. More than just books, libraries are places of information, offering people free access to a wealth of information that they often can’t find elsewhere, whether online, in print or in person. Whether they’re looking for DVDs or the latest best-seller; health or business information found on internet databases not accessible at home, or going for story times and community programming, the library is a center of community for millions of people. America’s 123,000 libraries fall into four basic types (with a few added variations): Public, School, Academic and Special. There are also Armed Forces libraries, Government libraries and multi-use or Joint-Use libraries, which combine library types in one service area or structure. Learn more about America’s libraries. At the center of all types of libraries is the librarian. 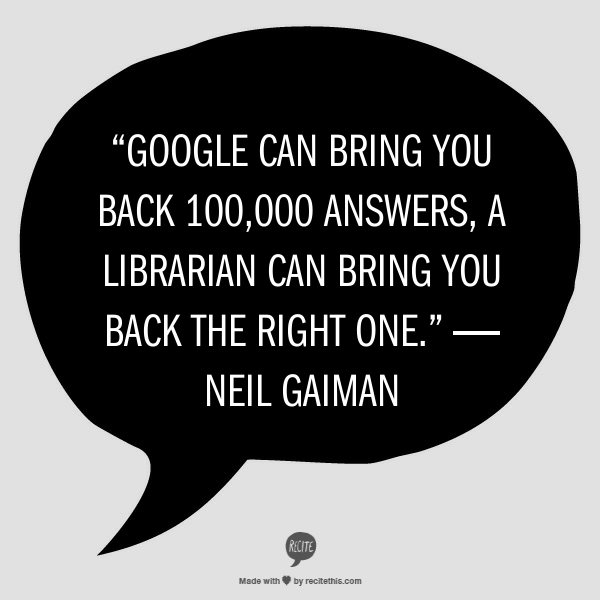 Librarians are information experts, selecting books relevant to the community, creating helpful programming, and connecting people to information. Categories: Celebrations, Community, Library Resources, National Observation | Tags: ALA, American Library Association, ilovelibraries, libraries, National Library Week | Permalink. April 8-14th is National Library Week Let’s Celebrate! National Library Week is April 8-14th and to celebrate, we will be offering free replacement cards! Now you don’t have to worry about trying to find that lost card! Just come on in with your identification and we can replace your card in minutes. In appreciation of our patrons, we will also be serving coffee and donuts in our lobby the morning of Thursday, April 12. Good while they last! In addition we are showering you with some fascinating programs this month, like Medical Quackery with Dr. Mike Cross, and a timely discussion with a couple of amazing anti-racism activists on talking about race. Hope to see you soon! Categories: Celebrations, National Observation, Programs | Tags: anti-racsim, library card, National Library Week, patron appreciation, rain gardens | Permalink. Where Did the Library Lead You? Today’s libraries lead their communities and transform lives every day. From education to job resources to lifelong learning, your library provides access to the programming and services you need to you reach your potential and grow as a leader. Join the Nevins Library, and libraries nationwide, in celebrating National Library Week this week, April 8-14, 2018. 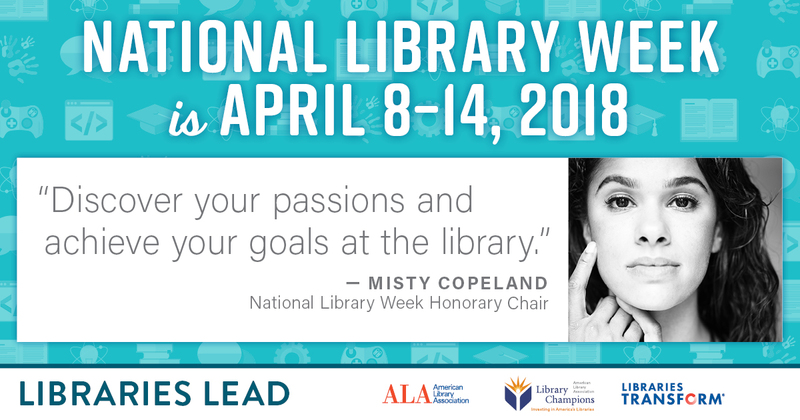 Tell us YOUR story of how the library led you to something of value in your life and you could win a $100 VISA gift card and a copy of “Firebird,” the Coretta Scott King Award-winning book by Misty Copeland, 2018 National Library Week Honorary Chair. Library lovers can post to Twitter, Instagram, or on the I Love Libraries Facebook page during National Library Week for a chance to win. Entries can be a picture, video, or text. Be creative! Just be sure to include the hashtags #NationalLibraryWeek and #LibrariesLead on your social media post for a chance to win. Join in the fun! The promotion begins Sunday, April 8 at 1pm and ends Saturday, April 14 at 1pm. For more information, visit the I Love Libraries webpage. For official rules, click here. Categories: Celebrations, National Observation | Tags: chance to win, I Love Libraries, libraries, Libraries Lead, Misty Copeland, National Library Week | Permalink. It is National Library Week! Did you know that? Every year there is a week dedicated to the appreciation of libraries in the United States and this year it is April 9-15. We hope that you can take time from your busy week to stop in and say hi, or visit us digitally through our web pages or downloading e-books or audio books! Have you misplaced your library card? Don’t worry, it happens to all of us. As part of this week’s celebrations of libraries, we will be offering you a FREE replacement card (normally $2). As always, a NEW library card is always FREE! Please bring in your photo ID and proof of Methuen residency and we’ll take care of the rest. Categories: Celebrations, National Observation | Tags: library card, National Library Week, Nevins Library | Permalink. Categories: Books, Celebrations, Poetry | Tags: book spine poetry, National Library Week, national poetry month | Permalink.